About this object1944 Dated US WW2 105mm M14 Type 1 Shell Case - This is a unique and historically important memento from World War 2. 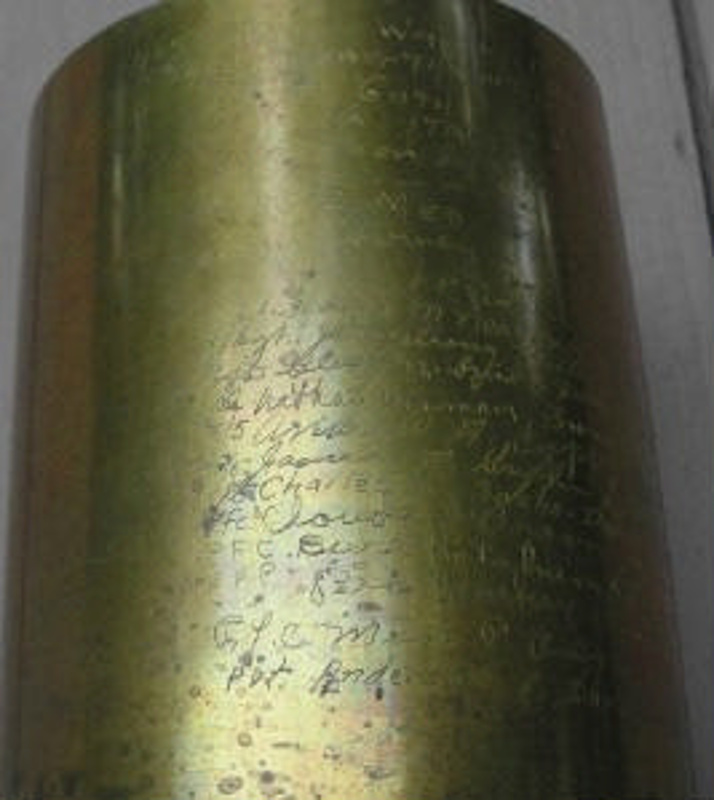 It is a 105mm shell casing, engraved with notations indicating it was used in the breakthrough of the Gothic Line in Italy in October, 1944 by the 5th Army, and then listing the names and home towns of members of the 135th Medical Composite Platoon. Bossolo da 105mm M14 Type 1 datato 1944 - Esempio unico di arte da trincea. Il bossolo è inciso con annotazioni indicanti l'uso in Italia nello sfondamento della Linea Gotica nell'ottobre del 1944 dalla 5th Army US. Riporta la lista dei nomi e dei luoghi dei membri del 135th Medical Composite Platoon - 56th EVAC. Capt. Harvey J. Kulin - Idpls. IND. 1st Lt. Jack R. Anderson, Kinney, Minn.
S/Sgt. J. Armstrong Miller, Drexel Hill, Pa.
Sgt. Glen M. Snider, Harrison, Ark. Cpl. Nathan Herman, Brom, N.Y.
T/5 Andrew A. Coppa, Medina, N.Y.
T/5 James M. Griffin, Sylacauga, Ala.
Pfc. Claude J. Brown, Osowotomie, Kans. Pfc. Burl Ketchum, Chicago, Ill.
Pfc. Mark P. Praga, Albany, N.Y.